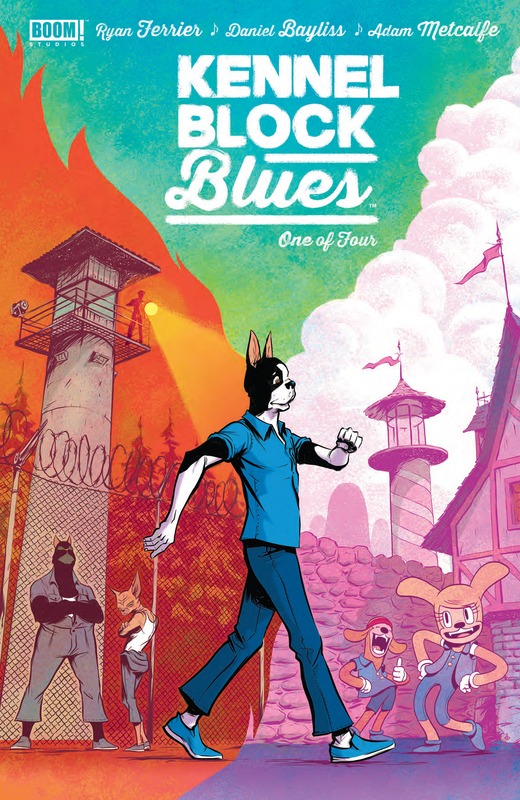 The Fellowship was fortunate enough to obtain a copy of KENNEL BLOCK BLUES #1 from BOOM! Studios. Ryan Ferrier writes, Daniel Bayliss draws, Adam Metcalfe colors, and Colin Bell letters. Oliver is not having a good day. When he’s nervous, he sings. And this is not going over well in his new home, the Jackson State Kennel. Happy dogs are really not welcome in prison, but he quickly makes friends with a big dog named Cosmo and Cosmo’s cellmate, Charlie. But when the cats make the alpha dog “disappear,” all hell breaks loose and Oliver is caught in the middle. This book is a page-flipping contradiction – part happy, almost silly, fun with bipedal pets and over-the-top characters, and part hard-bitten (sorry) prison drama. And not only are both done well, they mesh beautifully together somehow. The characters are likeable (except the cat gang, of course) and there’s plenty left unanswered (notably Chester and how Oliver got here). The art really helps to build that contrast, too, with realistic animal-people and the trippy combat/singing scenes. Fighting with the cats. Playing ball in the yard. Terrible food. Yes, it’s a dog’s life in the state kennel, and Oliver is totally out of his element. You’ll want to pick this one up. 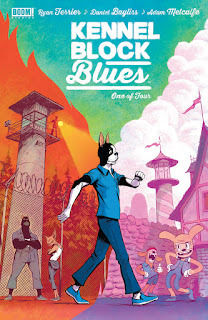 KENNEL BLOCK BLUES #1 is available now at your FLCS or at boom-studios.com.